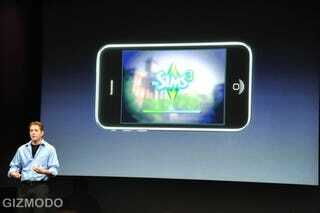 The Sims 3 for the iPhone will sell in-game items for 99 cents and play music from your library, according to a presentation by Apple earlier today. Electronic Arts allowed the company to show off their upcoming iPhone game during the presentation for the 3.0 upgrade for their device. The game will have in-app commerce, letting you buy items for the Sims in the App Store through teh game for $.099 each, according to Gizmodo. The game will also let you play music from the stereo in the game, pulling any of the music from your iPhone's music library. Gizmodo also pointed out that the game looked pretty great on the iPhone.